These crispy potato pucks work perfectly as an accompaniment to your favorite runny egg dish—they soak up that yolk like nobody’s business—or as a simple side with your very best roast chicken. Your new go-to side for just about any meal. The key is this: Oil. A lot of it. If you want those delectable crispy edges, do not be shy. Serves: Four people as a side dish. Works great as leftovers, too. Boil a medium pot of salted water. Cook potatoes in the water for about 15 minutes, or until you can easily pierce them with a fork. Drain and rinse with cold water to stop the cooking. Spread the potatoes out on a sheet pan. With a fork or the back of a wooden spoon (I prefer a fork because it makes lots of crispy ridges), press each potato into a disk. 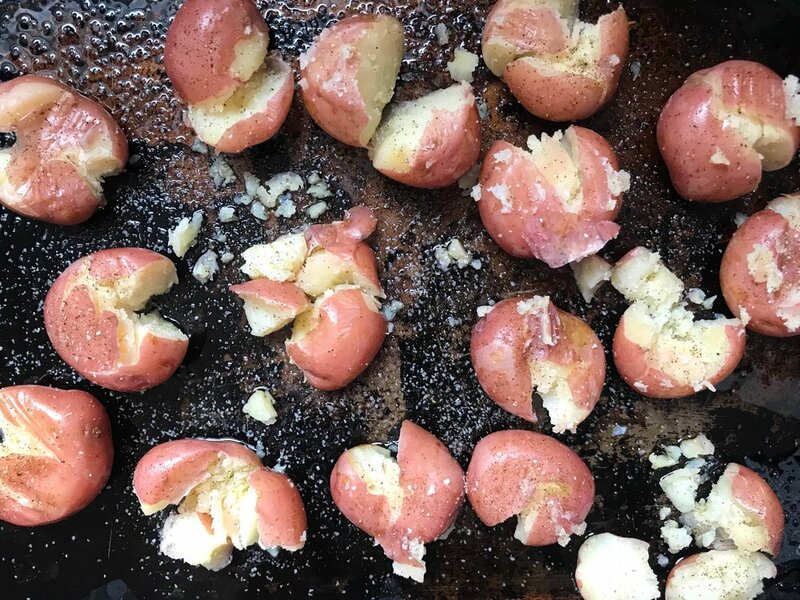 Don’t worry if some of your potatoes fall apart—all those tasty bits will crisp right up. Drizzle them all over with olive oil (like, a LOT of olive oil). Season with lots of kosher salt and freshly ground pepper. Scatter some whole rosemary sprigs on the pan. Cook at 400F for 20 minutes, or until golden-brown. NOTE: These work great as leftovers, too—whenever I have potatoes that are getting soft, I make some smashed potatoes and save them in the fridge for whenever.